From 1923, when it was known as the Glendale Airport, to the World War II era, when the military took it over, Grand Central Air Terminal was the main commercial airport serving Southern California and the ancestral home of what became Convair (General Dynamics) and Hughes Aircraft. 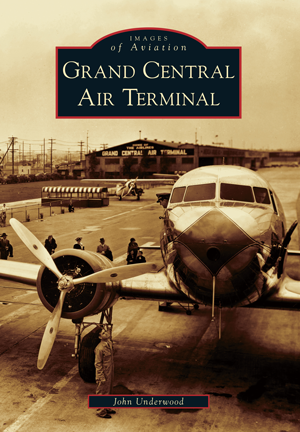 The first scheduled transcontinental passenger service was flown out of Grand Central by Charles Lindbergh, with Amelia Earhart among the passengers. Grand Central had the first paved runway west of the Rocky Mountains, and was a terminal for Pickwick, TWA, American, and Pan Am's Mexican subsidiary. After Pearl Harbor, commercial operations ceased and the Army Air Corps turned Grand Central into a training center and a key element in the air defenses for Los Angeles when a Japanese invasion seemed imminent. John Underwood, the author of a dozen books and scores of articles, drew on his extensive collection of historical aviation images to create this comprehensive pictorial tour through the formative years of commercial aviation in the West. Underwood learned to fly at the Glendale School of Aeronautics in 1949 while employed by Grand Central Aircraft, then refurbishing World War II-era C-46 Commandos, B-25s, and P-51 Mustangs for use by Third World allies.